My sewing room has been eerily quiet these days. I mentioned in my last post that I am moving over the next month, and while it will save us a good deal of money in the long run, and I’m getting a fresh and nicely furnished quilting studio out of the deal, I would so much rather be sewing and creating than packing and trying to sell extra things we don’t have room for! And, I’m still working two jobs while trying to get it all done! Last night I did get a break. 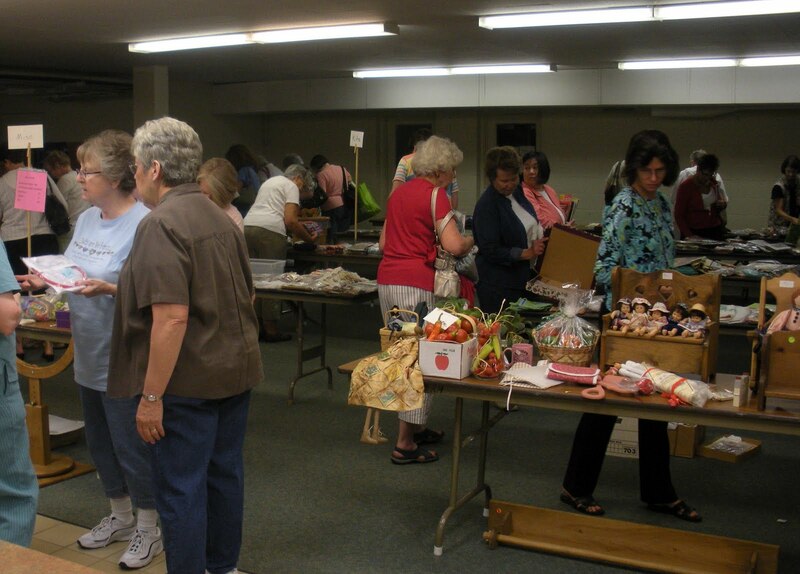 It was our guild meeting, and August is the fundraising meeting with a live auction and tag sale. Our guild raised over $12,000 for Breast Cancer Research last night in less than four hours! 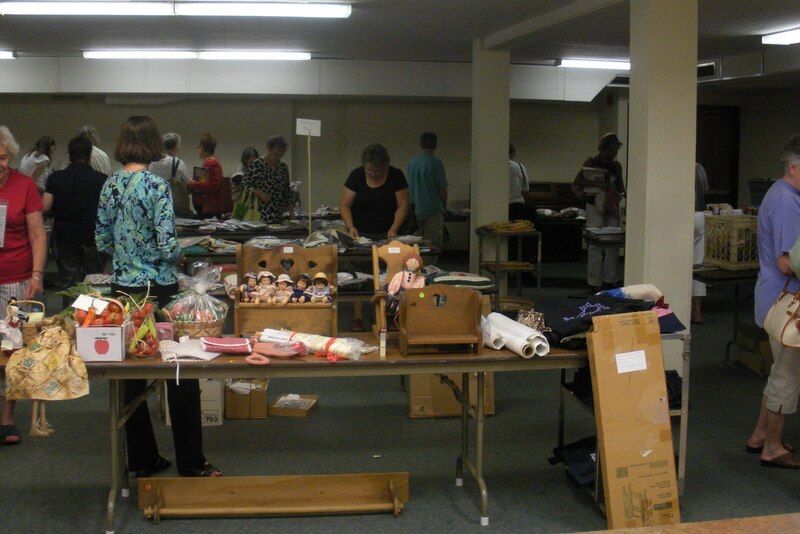 I didn’t take anything home from the live auction, but I did find a few treasures in the Mall In The Hall, the tag sale/rummage sale component that took place before the auction. 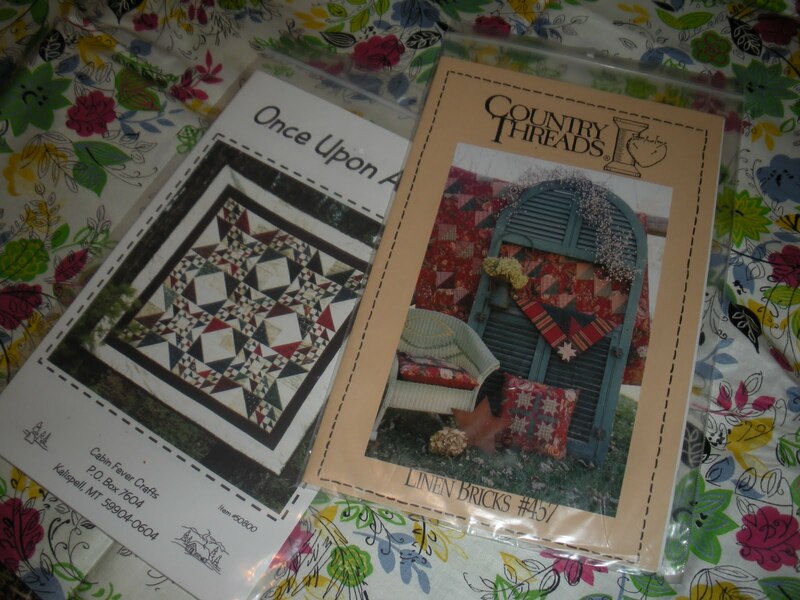 There are books, magazines, patterns, kits, fabric, quilt tops, completed quilts, fresh garden veggies, quilt racks, notions, batting, vintage blocks, new blocks, embroidery hoops, quilt frames, knick-knacks…you name it, it was probably for sale there. And the live auction included some gorgeous, beautifully quilted quilts, quilt tops with backing and binding included, bundles of quilty-goodness for wine lovers, chocolate lovers, batik lovers, fans of traditional quilts… There was a laundry bundle that included a tabletop ironing board, a Clover Mini Iron, Shout Color Catchers, Dryer balls, Orvis soap, Retayne, and many other quilt care products–clever! The creativity that went into some of these baskets was just amazing in itself! I wish you all could have been there…if you had, we might have been able to raise another $10,000! 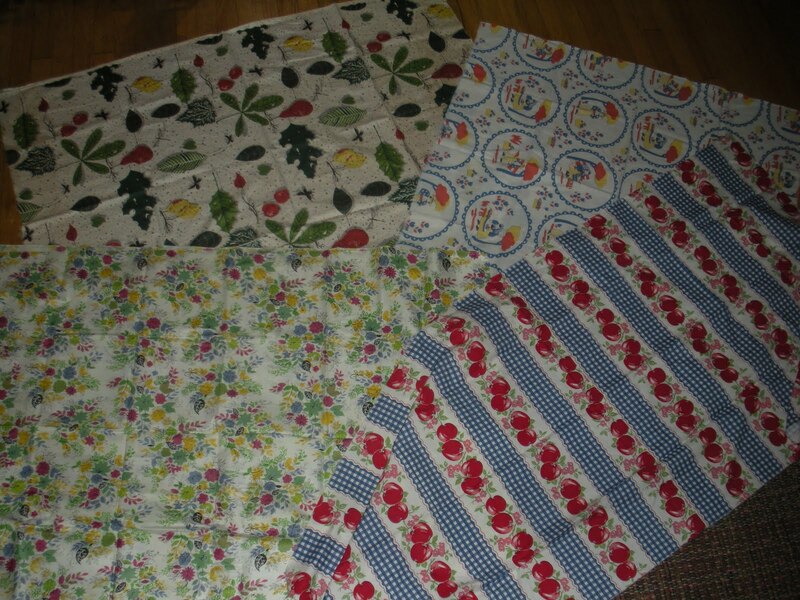 I brought home four pieces of vintage fabric from the Mall In The Hall sale…about six yards of 1940-1960 fabric in amazing condition (a few stains that I need to remove) for only $4.00! 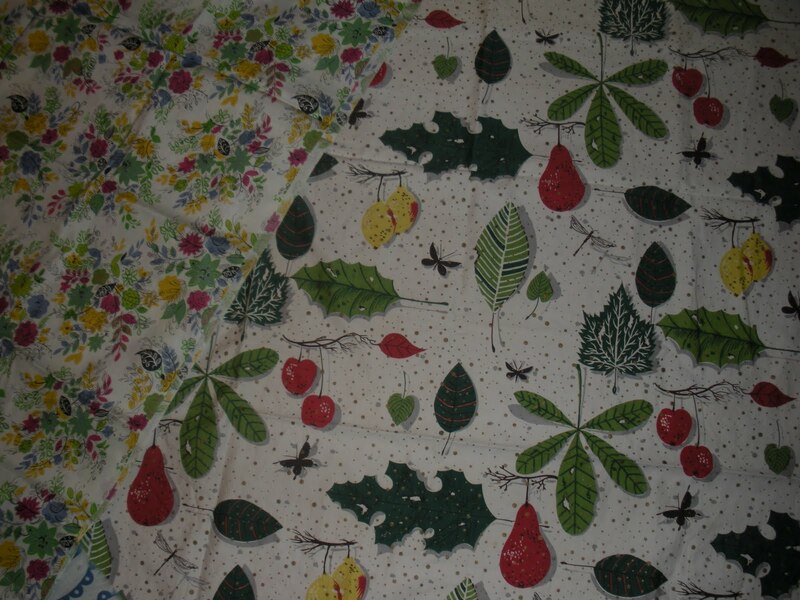 The leaf fabric is called “Spring Song” it appears to be from the early 1950s, it has the cutest little dragonflies and fruits and leaves…just great! It has a few stains, but I believe I can get them out. 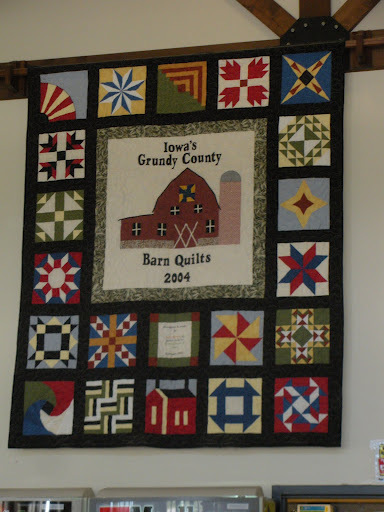 It’s a quilt that shows all of the blocks that adorn the barns throughout Grundy County, Iowa. You can see more here. The fabric is such a find. The Mall in the Hall sounds like it would be fun to visit. Of course I would come home with waaay more than I needed. I just love all the quilt blocks on the barns. While we were home visiting in Iowa I was snapping pictures of the various barns as well. Charming, simply charming idea. I didn't stay until the end of the auction, but I'm so glad to hear about all the money raised to benefit breast cancer research. Looks like you found some real treasures! Of course you would… you were already in the check-out line when I arrived! 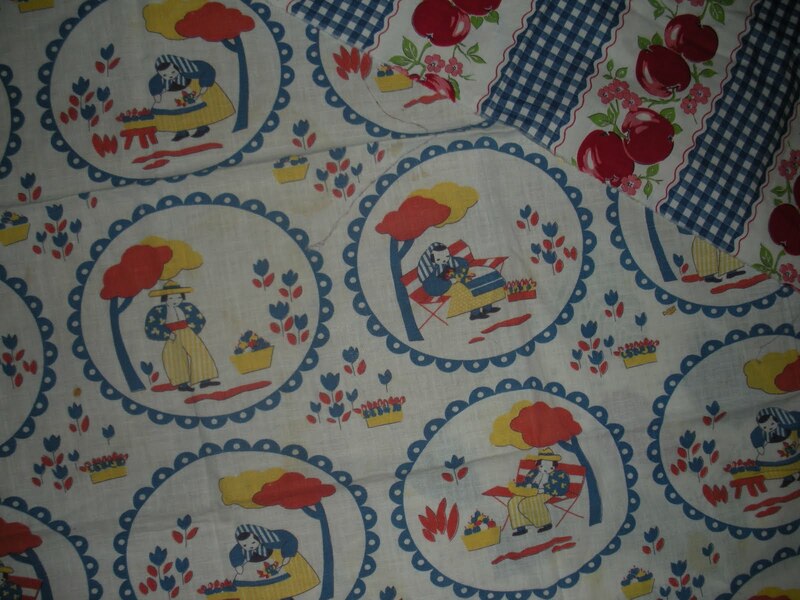 The vintage fabrics are beyond adorable. Wish I would have been there. The total amount of money raised is impressive. Quilt blocks on barns are one of my favorite things about driving here in Iowa. I love the Q with all the barn blocks. 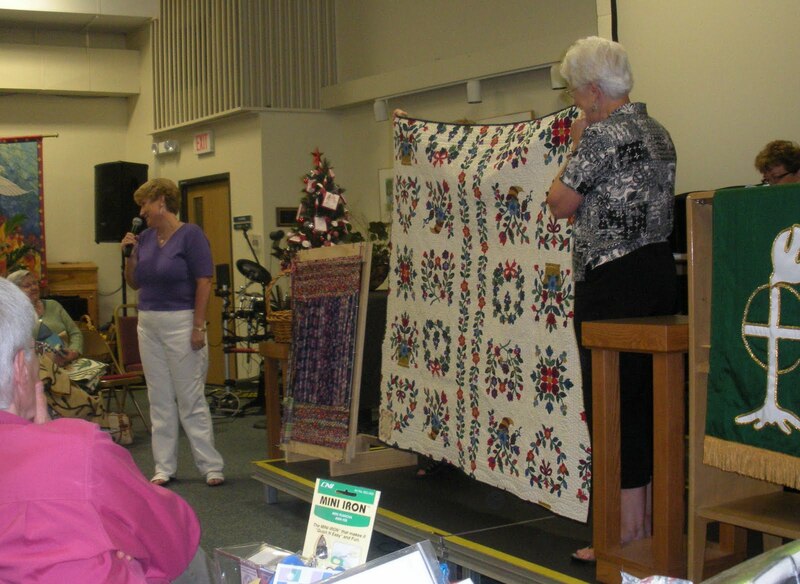 If you can't sew, you might as well go to a quilt meeting. I can't believe how much money was raised – What an amazing group! Looks like you scored with the shopping – I especially adore that leaf fabric. sounds like your 'break' was as action packed as your packing action back home. I bet you are finding 'things' that you have never seen before, don't know where they came from, or maybe, if your like me stuff that you hid from someone else years ago, and forgot! Good Luck with the move. What a great idea! 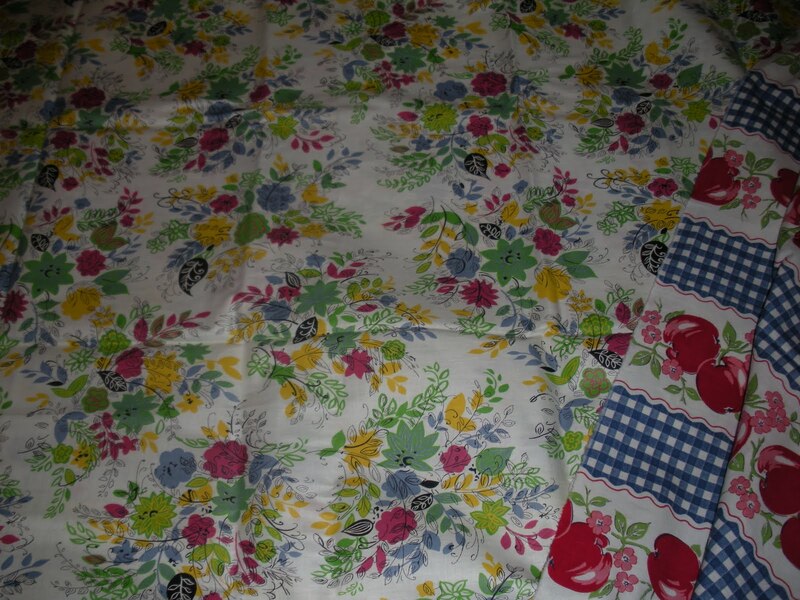 Those vintage fabrics are fabulous! if you don't want to unpack you can drive up and see me next week! a new studio for you! sounds so worth it! I'm thinking next summer, the midwest blog ladies need to meet up in southern MN…. what say you?